Last week, the last week of summer, I saw 20 patients who had survived breast cancer. 20 breast cancer survivors from Brooklyn and Staten Island in one week. Terrific. Happy Labor Day for these breast cancer survivors. All 20 had different types of breasts cancer and different stages and different treatments. 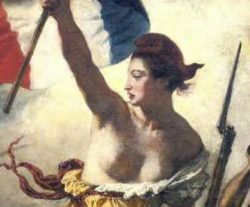 Some had breast cancer more than once. All were survivors and all had in common an opportunity to mark a new quantum of time over which they had triumphed over their disease. Summer was ending….It was in the air….The children and grandchildren of those survivors would be returning to school. 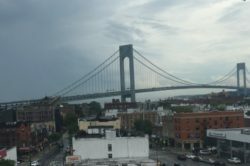 On this last day of summer, a late summer storm came over the Verrazano Bridge as seen from office. There was no summer fury in the storm; the rain was gentle. It looked worse than it was. After the staff had left for the day, I reviewed the records of these 20 patients. Like any oncologist I mark the time from diagnosis to the present. Survival time. Time without Disease. Tired, anxious to go home, I wondered what the total number of years these 20 patients had survived. It wasn’t a tough math problem–20 patients with 157 years of survival. Wow! 157 years of s urviving breast cancer. How great! 157 years of life. A century and a half. Nearly the full lifetimes of two octogenarians. 157 years of survival from only one week of survivors. Maybe I should run the numbers for a months of survivors or a year of survivors. Maybe then the scope of our triumph will be even more fully realized. Fifty years ago the number of survival years for these 20 patients would not have seen so high. Hopefully, breast cancer as a lethal disease is sputtering towards it end just as the summer now is….